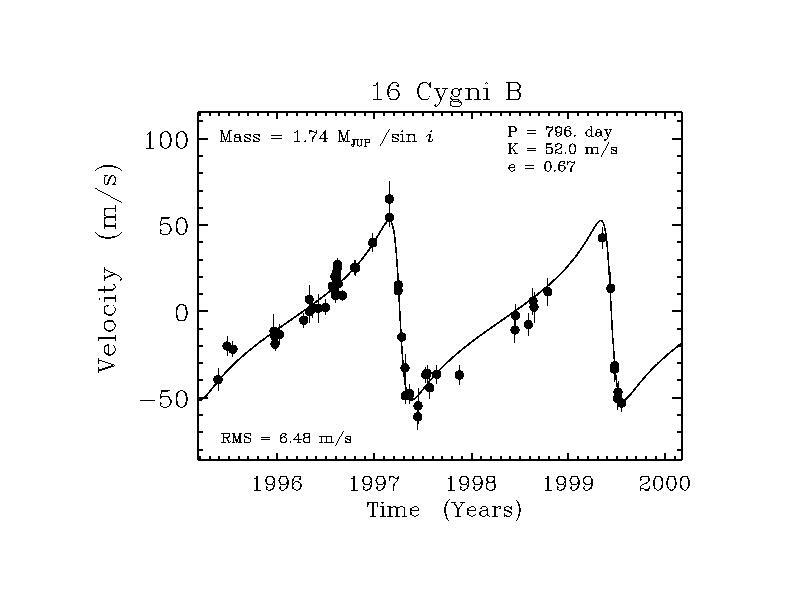 The measured Doppler velocities of 16 Cygni B. The curve drawn through the points is a Keplerian fit to the points, weighted by the errors. The derived orbital period is 2.2 years, the eccentricity is 0.67, and the inferred mass of the companion is Msini=1.7 Mjup. This remarkable planet around a Solar-like star (16 Cygni B, G5) was discovered by two teams independently (Cochran and Hatzes, and us). This planet's orbit has the largest ellipticity of any known planet. All of the planets in our Solar Systems reside in nearly circular orbits, having eccentricities less than 0.2 (for Mercury and Pluto). This new planet forces a reexamination of the planet-formation theory that predicts that other planets would all have nearly circular orbits. The discovery was made by measurements of the Doppler shift of the light of 16 Cygni B which is 85 light years from Earth. The star exhibits a periodic Doppler variation, with a period of 796 +- 5 days . The star changes its velocity by +- 52 meters/sec in a pattern that is not a sine wave which would occur for a circular orbit. The mass is at least 1.6 Jupiter masses and the actual mass of the planet may be slightly greater, the uncertainty being due to the unknown inclination of the orbit plane which enters into the orbital physics (as the trigonometric sine of inclination). Of some importance is the unprecedented eccentricity of the orbit, unlike that for any other planet. Its orbit carries the planet from a closest distance of 0.6 Earth-Sun distances to 2.7 Earth-Sun distances at its farthest from its host star, 16 Cyg B. The planet would experience extreme variations in the light energy it receives from its star, as it varies from Venus-like distances to Mars-like distances. This planet added to the interest in a previously discovered planet around the star, 70 Virginis. Its planet also has a large eccentricity of 0.4 , the previous record holder. But that non-circular orbit was so discordant with the expected circular orbits from theory, that some theorists noted that it might be dismissed as a "brown dwarf", thereby ignoring the problem of how a planet (or any object) might become so eccentric. Now, new theories must be found to explain these two eccentric planets. Proposed theories involve collisions of two planets that scatter them into wacky orbits (Doug Lin of UC Santa Cruz and Fred Rasio of MIT) , or gravitational perturbations from the disk of gas and dust out of which the planets formed (Pat Cassen of NASA Ames Research Center, and Pawel Artymovicz of Stockholm Observatory). This new planet was discovered completely independently by two teams: Drs. Bill Cochran and Artie Hatzes from the University of Texas and Drs. Paul Butler and Geoff Marcy of San Francisco State University and U.C. Berkeley.